Mawlana Rumi [, may Allah be pleased with him] was born on the 6th of Rabiul Awwal in the Islamic Hijri year 604 in Balkh, present-day Afghanistan. His father, Hazrat Bahauddin Walad [, may Allah be pleased with him], was a great Muslim scholar and also a Sufi saint who descends from the lineage of Sayyidina Hazrat Abu Bakr Siddiq [, may Allah be pleased with him], the first Caliph of Islam. Mawlana Rumi [, may Allah be pleased with him] grew up in this learned household in Afghanistan and became a fully accomplished scholar himself. Eventually, between the years 1215 and 1220, Hazrat Bahauddin Walad, with his whole family and a group of disciples, set out westwards. They peformed Hajj and then proceeded on their journey. They finally settled in Karaman, Turkey for seven years, where Mawlana Rumi's mother and brother both passed away. In 1225, Mawlana Rumi married Gowhar Khatun in Karaman and had two sons: Sultan Walad and Ala-uddin Chalabi. When his wife passed away, Mawlana Rumi married again and had a son, Amir Alim Chalabi, and a daughter, Malakeh Khatun. On 1 May 1228, most likely as a result of the insistent invitation of Alauddin Keyqobad, ruler of Anatolia, Hazrat Bahauddin Walad finally settled in Konya in Anatolia within the westernmost territories of the Seljuk Sultanate of Rum. On the road to Anatolia, Mawlana Rumi encountered one of the most famous mystic Persian poets, by the name of Fariduddin Attar, in the Iranian city of Nishapur, located in the province of Khorasan. Attar immediately recognized Rumi's spiritual eminence. He saw the father walking ahead of the son and said, "Here comes a sea followed by an ocean." He then gave Mawlana Rumi his ‘Asrarnama’, a book about the entanglement of the soul in the material world. This meeting had a deep impact on the eighteen-year-old Mawlana Rumi, and later on became the inspiration for his works. One of Hazrat Bahauddin Walad's students, Hazrat Sayyed Burhanuddin Muhaqqiq Termazi, continued to train Mawlana Rumi in the religious and mystical doctrines of Hazrat Rumi's father. For nine years, Rumi practiced Sufism as a disciple of Hazrat Sayyed Burhanuddin until the latter died in 1240 or 1241. Hazrat Rumi's public life then began: he became a teacher who preached in the mosques of Konya and taught his adherents in the Madrasa. However, it was his meeting with the dervish Hazrat Shams Tabrez on 15 November 1244 that completely changed Rumi's life. Hazrat Shams had travelled throughout the Middle East searching and praying for someone who could "endure my company". A voice said to him, "What will you give in return?" and Hazrat Shams replied, "My head!". 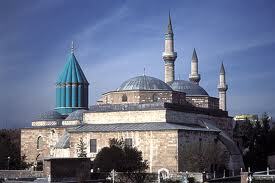 The voice then said, "The one you seek is Jalaluddin of Konya." One version of the famous meeting that Mawlana Rumi had with Hazrat Shams Tabrez [, may Allah be pleased with him], was that once Mawlana Rumi was teaching a group of his students and referring to his handwritten books & notes while Hazrat Shams Tabrez happened to come along and asked him about those notes. Mawlana Rumi [, may Allah be pleased with him] replied that the books and notes were beyond the understanding of Hazrat Shams Tabrez. Then Mawlana Rumi [, may Allah be pleased with him] continued his class, meanwhile Hazrat Shams Tabrez [, may Allah be pleased with him] threw all the books into a nearby pond of water. The students noticed this and started beating him. This caught the attention of Mawlana Rumi who complained about losing his knowledge. Hazrat Shams Tabrez [, may Allah be pleased with him] replied that he could return the books, so he recited ‘Bismillah’ and retrieved the books from the water, which to everyone’s surprise, were still intact. Seeing this, Mawlana Rumi [, may Allah be pleased with him] was amazed and asked how this was possible – to which Hazrat Shams Tabrez replied that such knowledge was beyond that of an external scholar. Thus began the relationship between Mawlana Rumi [, may Allah be pleased with him] and Hazrat Shams Tabrez [, may Allah be pleased with him]. At this stage, Mawlana Rumi is reported to have mostly retired from his public life and spent a lot of time with Hazrat Shams Tabrez [, may Allah be pleased with him]. They would spend days discussing divine issues and Sufi thoughts, to the extent that Mawlana Rumi would not teach his classes or visit his family for long periods of time. "Why should I seek? I am the same as He. Mawlana Rumi [, may Allah be pleased with him] then formed companionship with Hazrat Salahuddin Zarkub a goldsmith. After Hazrat Salahuddin's death, Mawlana Rumi's scribe and favorite student, Hazrat Hussam Chalabi, assumed the role of Mawlana Rumi's companion. One day, the two of them were wandering through the Meram vineyards outside Konya when Hazrat Hussam described to Mawlana Rumi an idea he had: "If you were to write a book like the Ilahinama of Sana’i or the Mantiqut-Tayr of 'Attar, it would become the companion of many poets. They would fill their hearts from your work and compose music to accompany it." Mawlana Jami [, may Allah be pleased with him] says that ‘Ney’ also means non-existent, because these men are emptied of themselves. Finally he says ‘Ney’ refers to the reed-pen. A pen’s writings are fully controlled by its writer, which also points to men emptied of existence and perfectly submitting to the will of Allah, The Most Exalted. I am the dust on the path of Muhammad, peace and blessings of Allah be upon him,, the Chosen one. Mawlana Rumi states in his Diwan-e-Shams: "The Sufi is hanging on to Muhammad, peace and blessings of Allah be upon him,, like Abu Bakr [, may Allah be pleased with him]." "How doest thou know what sort of King I have within me as a Companion? Do not cast thy glance upon my golden face, for I have iron legs." Mawlana Rumi [, may Allah be pleased with him] passed away & reunited with his Beloved Lord on 5th Jamadiul Aakhir 672 Hijri in Konya Sharif, Turkey. His tomb is near to that of his friend & guide, Hazrat Shams Tabrez [, may Allah be pleased with him] and his body was laid to rest beside his father under a beautiful tomb named Yesil Turbe or ‘the Green Tomb’. "When we are dead, seek not our tomb in the earth, but find it in the hearts of men." Mawlana Rumi [, may Allah be pleased with him] was a poet, jurist, theologian and scholar of the highest accord. He emphasized however that true knowledge is not found in books, but at the feet of the Noble Friends of Allah Almighty. Jis qaafla-e-shawq ka salaar hai Rumi"
Meaning: "You too are a member of that caravan of longing, O Iqbal! That caravan of longing whose guide is Rumi."